grandma's cookie jar: Make a Summer Memory Wall!!! In my last post I shared a link for 30 Fun Summer Ideas which you could do with your grandchildren over the summer, so now I want to share another great idea I found on Pinterest which you could do to help your grandchildren document and remember all the fun things they do with you over the summer . . . their own Summer Memory Wall!!! I love to write, so an idea which encourages children to document their fun summer activities - either by writing or drawing pictures - is an idea I'm absolutely going to LOVE!!! 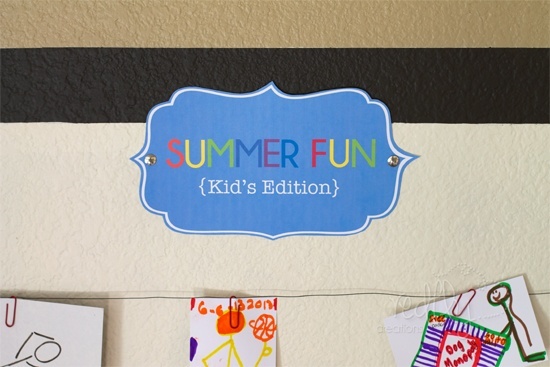 Just follow this link and you'll find a free printable for a "Summer Fun" sign and simple directions for making your "gallery"! Grab some index cards - or just cut paper to the size you want, get some crayons, markers or colored pencils and have fun helping your grandchildren document all the fun they have with you over the summer! I think it would be great fun to make the cards into a book at the end of the summer - so have fun with all the things you are going to do with your grandchildren this summer and be sure to include opportunities for your grandchildren to serve others, too!